Radical Acceptance. Do microbes or the zodiac make you depressed? 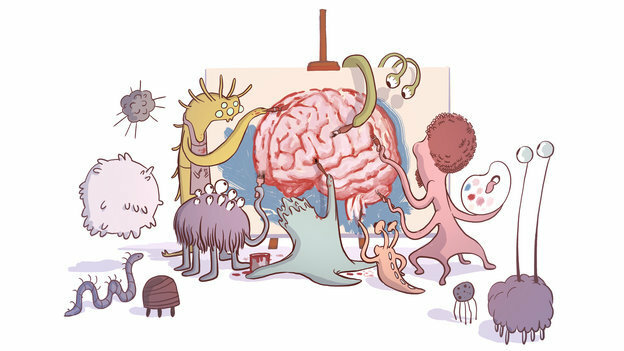 There was a neat piece on NPR today about gut flora and mental illness which postulated a link between the health of one's inner beasties and one's mind. Marsha Linehan, the psychologist who developed Dialectic Behavioral Therapy, used for treating substance abuse and borderline personality disorder, among other mental illnesses, talks about the importance radical acceptance. Linehan does not mean that we accept our brokenness, our faults, our failings and stay there. As Carl Rogers said in On Becoming a Person, "The curious paradox is that when I accept myself just as I am, then I can change." Linehan, in a very courageous move, recently talked about her own experiences of mental illness, including many attempts at suicide and her recovery from it which was prompted by a religious vision which included a profound feeling of self-acceptance. The idea of radical acceptance, even for the purpose of change, seems profoundly lacking in our thinking about health. In North America, at any rate, we are meant to view ourselves as our own greatest work of art, as perfectible. I am in the change business. If diet can help people with mental illness then I want to know about it. But I also believe that sometimes a hyper-developed sense of agency, which is pretty much the modern condition, oddly, keeps people stuck. Sometimes we have to accept even our darkest feelings, "meet them at the door, laughing, and invite them in" before we can learn what they came to teach us.